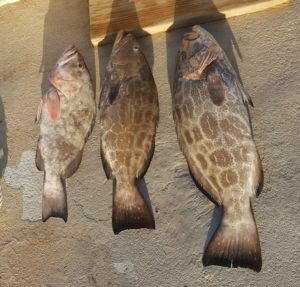 Had a trip with forum member HollywoodJoe and he wanted to target Groupers. He brought fresh speedos and we loaded up the World Cat with ice, bait and gear. Headed out NE to look for groupers and muttons. I had a few spots but have not spent much time on them since Irma. Got to the first spot and the bottom looked good, sounder had good marks and we anchored in the right spot on the first time. Got set up and put some chum on the bottom and the lines in the water. It started out slow – very slow, couldn’t even catch much on the chicken rig for bait. We worked this area hard because the bottom machine looked so good. Joe did hook up right away – twice, but pulled up 2 big nurse sharks. After working chuck bait, livies and chum with only a short mutton to show it was time to move. Next spot next to a wreck and the bottom machine lights up. Anchored up and worked this area hard and only producing small YTs. Move further west in 80’ of water with a small ledge, sounder looks good so we drop anchor. We drifted for 300’ before anchor grabbed and were not on the spot I wanted. Pull anchor, try again and this time we hit the mark. Got the rods set up and start dropping bait. This area was slow and steady with plenty of bait coming on chicken rig. Joe is dropping fresh speedos and I am putting down live grunts. After about 15 minutes my crowder meat stick is bent over. Drag is locked down and I crank a fast as possible to keep away from tax man. 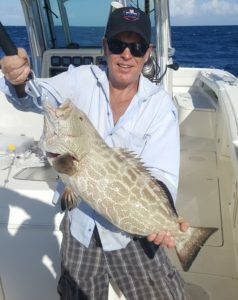 Finally get a grouper to the surface and it is barely hooked. With that first one in the box Joe switches to live bait and not too long after he is hooked up. After several sharks and break offs this one feels like the right one. After a quick battle he pulls in a nice red grouper. Now we got two in the box and it feels pretty good after all the sharks and snags. A few drops later Joe gets hooked up again and it is heavy. 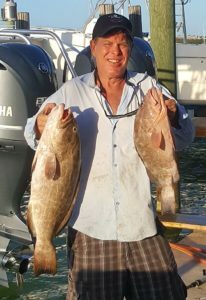 He puts the heat on it and pulls up the biggest grouper of the day. The bite seemed to die off after that one but we were trying to the limit. It was a lot of work but the hot bite seemed to be in a 2 hour window. Picked up and headed toward sister creek. Love the way this cat eats the waves. We cruised out and back comfortably at 30mph. Back to the dock the clean boat, gear and fish. Target acquired and great day fishing with a good guy.